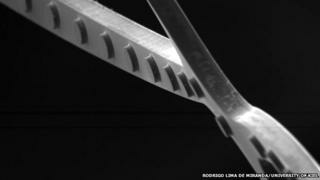 Engineers have produced an alloy that springs back into shape even after it is bent more than 10 million times. "Memory shape alloys" like this have many potential uses, but present incarnations are prone to wearing out. The new material - made from nickel, titanium and copper - shatters previous records and is so resilient it could be useful in artificial heart valves, aircraft components or a new generation of solid-state refrigerators. Memory alloys are already used in some situations, including surgical operations. A stent, for example, might be squashed into a small space and then spring into its designed shape to prop open a blood vessel. But the alloys have never entirely fulfilled their promise and entered the world of "high cycle fatigue" applications. "Usually shape memory alloys - like in minimally invasive surgery - they regain their shape once, or a few times, but not multiple times," explained Prof Manfred Wuttig, one of the new paper's senior authors, from the University of Maryland in the US. "This is highly unusual. It's kind of a leap forward," he told the BBC. Prof Wuttig developed the new alloy with colleagues at the University of Kiel, in Germany. The key to its remarkable properties is the way it is crystallised. The nickel, titanium and copper atoms are arranged in such a way that they can switch between two different configurations - again and again and again. This "phase transition" is what causes the alloy to snap back into shape after it is bent. It can be triggered by heat, or, in a different form of the alloy, it can happen as soon as the tension is released. In particular, the team reported it was tiny particles of an impurity - a chemical formed by titanium and copper, Ti2Cu - that smoothed out the switching process. "This particular precipitate is fully compatible with both crystal structures, so it sort of assures that they fully transform from A to B and back again," Prof Wuttig said. The team made the alloy in tiny 1cm-square pieces, much less than 1mm thick, and tested it using both heat and stress. To rack up 10 million cycles took some patience and some automation, Prof Wuttig said. "With stress it's not so difficult. You can buy [or build] little stress-strain machines... So you can automate that and then it's not so difficult. But it takes in the order of weeks to generate the number of cycles. "It's much more difficult with temperature." The team used a specialised furnace system to rapidly heat and cool the samples a full 10 million times. "Again, it took a few weeks to conduct the experiment," Prof Wuttig said. They examined the changes in the alloy's structure using powerful microscopes, as well as X-rays. "We did experiments in a synchrotron, where the X-rays would tell us exactly what the crystal structures are," Prof Wuttig explained. In a comment article for the journal, Prof Richard James described the attainment of 10 million cycles as "breathtaking". Prof James, from the University of Minnesota, was involved in the previous development of a memory alloy that withstood some 16,000 cycles. The research was also applauded by Prof John Huber, a materials engineer at the University of Oxford. "It's a significant find," he told BBC News. "Normal shape memory alloys show quite significant changes in their properties, over quite a small number of cycles. The properties decay away. "[Ten million] is what you start to need for cyclic applications - it gets you into the high cycle fatigue regime. That opens up potentially quite a lot of applications." Prof Huber said the properties might prove useful in the wing flaps or "control surfaces" of aircraft, or the unfolding solar panels of a spacecraft, as well as artificial heart valves. Prof Wuttig and his colleagues are particularly interested in refrigeration. "Your refrigerator has a compressor. It compresses and expands a liquid that goes through phase transition," Prof Wuttig explained. "So instead of that liquid, you could use this alloy." This is only an option because of the alloy's record-breaking endurance, he added. "That alloy needs to be stressed and recover millions of times. Refrigerators have to last 20 years, right? That's the expectation."